From Josh Raynolds at Vinous: "High-pitched raspberry, cherry and floral pastille aromas are complemented by suave Asian spice and smoky mineral flourishes. 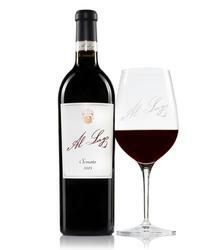 Fine-grained tannins sneak in slowly on a very long, seamless finish." Composed of 60% Cabernet Sauvignon, 20% Syrah and 20% Sangiovese, the 2015 Sonata sports a medium to deep garnet-purple color and is scented of black cherries, black raspberries, red currants and blackberries with hints of garrigue, lavender, licorice, dried Mediterranean herbs and tobacco leaf. Medium-bodied with a chewy backbone and oodles of freshness, the palate possesses wonderful energy and vivacity with a long savory nish. Produced by Guillaume Fabre of Clos Solene, this is a wine of fantastic elegance and sophistication, though sadly only 65 cases are available. Vivid ruby-red. High-pitched raspberry, cherry and floral pastille aromas are complemented by suave Asian spice and smoky mineral flourishes. Sweet and focused on the palate, offering vibrant red and blue fruit flavors and hints of vanilla and cola that gain strength on the back half. Fine-grained tannins sneak in slowly on a very long, seamless finish that leaves cinnamon and rose pastille notes behind. Brought up in 70% new French oak and made from 60% Cabernet Sauvignon and the balance equal parts Sangiovese and Syrah, the 2015 Sonata is another terrific red from this estate. Blackcurrants, toasted spice, vanilla bean, graphite and leafy herbs all give way to a nicely concentrated, elegant, polished red that's still relatively tight and reserved on the palate. Give it a few years and it should drink nicely for a decade or more.